Asia Pacific Environmental Network (APEN) holds a vision of environmental justice for all people—that all people have a right to a clean and healthy environment in which their communities can live, work, learn, play and thrive. They believe educating and activating a new constituency of low-income Asian and Pacific American immigrants and refugees through grassroots organizing, policy education, and civic engagement advances California and the country on a path towards climate justice. Their focus is to build a powerful and interconnected movement for social, economic and environmental justice that cools the planet. Towards this vision, APEN brings together a collective voice to develop an alternative agenda for environmental, social and economic justice. Their work serves to create jobs and economic opportunity and stability for current and future generations of Californian families by growing a renewable energy economy. Hidden Leaf’s 2018 grant to APEN supports their deepening somatic work with staff and leadership team members. Over the last 37 years, Ashoka has identified, supported, and built a community and the world’s largest network of leading social innovators, more than 3,500 in over 90 countries. Ashoka Fellows champion innovative new ideas that transform society’s systems, improving the lives of millions of people. Ashoka offers a lifelong fellowship where every member is committed to championing new patterns of social good. Beyond the fellowship, Ashoka has also helped countless other changemakers accelerate the rate of social change, through engaging business, the philanthropic sector, universities, and government in partnerships aiming at co-creating value for the greater good. Hidden Leaf’s grant to Ashoka supports their Learning & Development Initiative, a program through which they are documenting the new mindsets, amplified changemaking skills, and systems that enable staff to grow into new ways of being and leading in order to advance transformative social impact. Bend the Arc exists to create a just, fair, and compassionate America. Its mission is to engage Jews in sustained action that manifests the tradition of working to heal and repair the world, and to create a powerful, widely recognized Jewish voice championing equality and justice. Bend the Arc is the only national progressive Jewish organization that focuses on domestic issues. Its work incorporates three core approaches: 1) advocacy on issues that diminish inequality and increase opportunity for all Americans, including immigration reform, marriage equality, progressive tax reform, and voting rights; 2) organizing and base-building through online platforms and field building strategy; 3) signature leadership programs that help build and strengthen a pipeline of leaders firmly grounded in a shared set of faith values, and armed with the moral authority and prophetic call to action needed to foment large-scale social change. Biomimicry for Social Innovation is a network of practitioners applying nature’s intelligence into transformative pathways for leadership, organizational change, and cultural evolution. BSI offers trainings, tools, consultation, and coaching, as well as a platform to cultivate the emergence of a global learning community that can guide social innovation with nature-based practices. Their purpose is to shift the way humans relate to the rest of the natural world—to approach as student in relation to a mentor— and to become aware of ourselves as a humble member of a thriving and interconnected community of life on Earth. BSI’s intention is to catalyze a shift in consciousness so as to deepen humans’ respect for the natural world, learn deeply from nature’s wisdom, and create conditions for a life-affirming, just, and regenerative future. BOLD is a national leadership training program designed to help rebuild Black social justice infrastructure in order to organize Black communities more effectively and re-center Black leadership in the U.S. social justice movement. BOLD fulfills its purpose by equipping Black organizers and Black leaders of social justice organizations with the personal and organizational tools they need to build and sustain trusted relationships, strong organizations, and allied social movements, and to be more strategic and effective change agents. BOLD’s curriculum has three domains: transformative organizing, embodied leadership, and political education. They use somatics to increase self awareness and create paths/commitments of individual, organizational, and movement transformation. Over its first five years of operation, BOLD has trained 150 Black leaders from more than 80 base-building organizations and alliances, mobilizing around the school-to-prison pipeline, mass incarceration, gentrification, unemployment, voter disenfranchisement, and health care. Canopy Planet transforms unsustainable paper production and consumption to deliver systemic change to some of the most pressing environmental issues facing humanity: forest loss, species decline and climate change. By harnessing the power of more than 700 book publishers, magazines, newspapers and printers, Canopy Planet generates leverage that results in innovative environmental solutions and forest conservation. Their work is rooted in the belief that, given the opportunity, tools and experiences, people will contribute towards a positive legacy, regardless of their line of work. They value people and strive to build relationships that are open, constructive and mutually enriching. In addition to transforming the market drivers behind unsustainable industrial forestry, Canopy Planet aspires to contribute to a paradigm shift – and return human connectivity to wild spaces. They work to build a compassionate and interconnected society, one that exists within the earth’s natural bounds and advances the wellbeing of humanity and all living things. This grant supports Canopy’s efforts to build a deeper practice of mindful leadership within their organization. Center for Whole Communities (CWC) fosters inclusive communities that are strongly rooted in place, where all people – regardless of income, race, or background – have access to and a healthy relationship with the natural world. CWC strengthens the capacities of environmental and social sectors by connecting their leaders to one another, by helping them to develop more durable and compelling responses to problems that cannot adequately be addressed in isolation, and by transforming their movements to act in concert with each other’s goals and aspirations. CWC holds a unique strategic position as a bridge between diverse groups; they take on the issues that in the past have created divides: the necessity to think and act beyond narrow definitions of success, the consequences of specialization that limit our efforts and ability to connect with others, and the roles of race, class and privilege in organizations and movements. The Coalition for Humane Immigrant Rights of Los Angeles (CHIRLA) is a California leader with national impact made of diverse immigrant families and individuals who act as agents of social change to achieve a world with freedom of mobility, full human rights, and true participatory democracy. CHIRLA’s mission is to achieve a just society fully inclusive of immigrants. CHIRLA organizes and serves individuals, institutions, and coalitions to build power, transform public opinion, and change policies to achieve full human, civil, and labor rights. Guided by the power, love, and vision of community, CHIRLA embraces and drives progressive social change. For 29 years, CHIRLA’s innovative programming in community education, community organizing, civic engagement, policy and advocacy, and leadership development for youth has served the immigrant communities of the Los Angeles region. Hidden Leaf’s 2018 grant to CHRILA supports the bolstering of practice within the organization’s leadership and staff, as well as the expansion of mental health and wellness to CHIRLA’s base and the broader immigrant communities the organization serves. The mission of Climate Justice Alliance (CJA) is to build local resilience, remedy climate change’s root causes, and lead a Just Transition out of the extractive energy economy. CJA is comprised of frontline communities who hold the vision to respond to the interconnected climate and economic crises through meaningful, regenerative ways of working and living in harmony with the planet to build healthy, sustainable, just communities using non-extractive models, practices, and policies. CJA is an alliance of 68 community, frontline, and environmental justice organizations; movement networks; and support organizations at the forefront of the climate crisis. Hidden Leaf’s grant supports CJA to develop and deepen the capacity of staff and leadership to ground personal, community, and movement-building spaces in culture, compassion, and creativity that recognizes injustice and conflict, heals communities, and honors the natural world. Daily Acts’ mission is to transform local communities through inspired action and education, which builds leadership and local self-reliance. To address “the crisis of consciousness and connection at the heart of our ecological and social issues,” they help reconnect people to their own power, to community, and to nature. Daily Acts’ models create solutions that regenerate nature and unleash community genius while spreading the skills, models, and policies to reduce resource use and catalyze local self-reliance. Hidden Leaf’s grant to Daily Acts supports internal efforts to make the values of self-care and personal ecology (that are ultimately at the heart of their work) more explicit in their written language, resources, program models, and replication trainings. Additionally, the grant supports the integration of transformative change approaches into the Daily Acts Leadership Institute and the Sonoma County Resilient Homes and Hubs Network. The East Bay Alliance for a Sustainable Economy (EBASE) convenes coalitions of community, labor, and people of faith to build power with low-income workers and communities of color and fight for economic and racial justice. EBASE embraces a “whole-worker” approach to holistically engage low-income workers, people of color, and immigrants to achieve economic justice. Through its campaigns, EBASE intentionally embeds opportunities for workers and residents to engage in transformational leadership experiences. By pushing themselves to develop a new skill, embody a new role, and otherwise push their personal growing edge, grassroots leaders’ internal transformation changes the way they stand up for their communities. EBASE’s faith-rooted organizing program, FAME, utilizes an interfaith approach, uniting spiritual traditions to infuse the economic and racial justice movement with love, joy, and hope. Hidden Leaf’s 2018 grant supports EBASE campaign leaders to bring transformative practices further into coalition spaces and an interfaith approach to strengthening personal commitments to justice. The East Bay Meditation Center (EBMC) is a non-religious center located in downtown Oakland that provides training in inner awareness practices to the diverse populations of the Bay Area, especially those who may not feel welcome in a traditional meditation center. EBMC has been called the most diverse meditation center in the country. The three pillars of EBMC’s mission are: Training in Inner Awareness Practices; Transformative Social Action; and Diversity. Because their mission specifically focuses on Transformative Social Action, and they emphasize the connection between inner transformation and progressive social change, the center draws a large number of social justice activists. EBMC holds a vision of a culture of social change work that is kind, non-blaming, non-harming, strategically effective in reaching activist goals, compassionate, and skillful in communication and in action. Much of their programming is designed to support the efforts of individuals to bring these skills to their social justice work. They charge no fees for their programs, which makes the teachings and refuge they offer open to everyone regardless of socioeconomic class. This grant supports EBMC’s Practice in Transformative Action yearlong program for social justice activists and transformative thought leaders. Forward Together promotes and protects reproductive justice through organizing, building leadership capacity, and developing alliances and education to achieve community and systemic change. Reproductive justice exists when all people have the economic, social and political power and resources to make healthy decisions about their gender, bodies, and sexuality for themselves, their families and their communities. 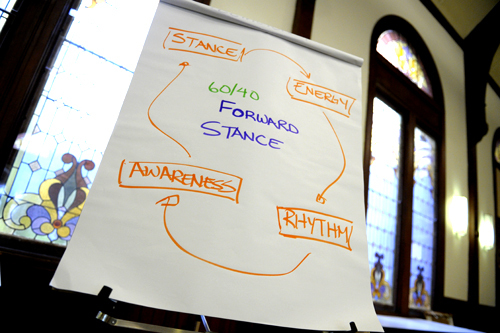 Forward Together’s efforts at capacity building, leadership development, and agenda alignment have found their deepest expression in the development of their transformative practice, Forward Stance. The Forward Stance core principles—energy, synergy, rhythm, momentum, positioning, leveraging, and awareness—physically link how our consciousness can increase or decrease our effectiveness as leaders working towards social change. By integrating Forward Stance into the infrastructure of the emerging Reproductive Justice Movement from the ground up, Forward Together helps to build power and strengthen the capacity of the progressive movement as a whole. The mission of Generative Somatics is to grow a transformative social and environmental justice movement that integrates personal and social transformation, creates compelling alternatives to the status quo and embodies the creativity, rigor and life-affirming actions we need to forward systemic change. They formed the Somatics and Social Justice Collaborative to create theory, principles, and processes to address consumptive and destructive patterns in our communities, through deeper, transformative change at the individual organization and movement level — to bring transformation to the center of how we create lasting systemic change through organizing and movement building. Somatics understands that we “embody” our social environments and then act from those deep habits/learnings. Justice Funders seeks to abundantly resource social justice movements while also proactively creating regenerative economies that build wealth in low-income communities of color. In order to achieve this, they challenge ingrained philanthropic practices that uphold the accumulation of wealth and power, working toward deep, systems-level transformation that practices redistribution of wealth, democratizes power and shifts economic control to communities. Hidden Leaf’s grant supports the pilot of Maestra, a leadership development learning and coaching program to equip philanthropic executives with the strategies, skills, and support to guide their organizations through a Just Transition, aligning practices with the values and needs of the communities they fund. At the heart of this program is the belief that in order for philanthropic executives to embrace a Just Transition for their institutions, they must have the ability to imagine an alternative to the dominant structures of organized philanthropy and begin practicing into that alternative. Maestra is premised on the belief that participants require a deep, personal transformation which can only be facilitated with the integration of a transformative practice. Leadership Now: Ohio is a partnership between the Ohio Transformation Fund and the Rockwood Leadership Institute. It is an eight-month cross-sector fellowship program for social change leaders in Ohio designed to create dramatic shifts in leaders’ capacity to engage their organizations and communities to build networks that drive statewide strategy. The goals of the fellowship are to: a) increase the individual leadership effectiveness of leaders working toward social change in Ohio; b) provide opportunities for building trust, collaboration, and networks between leaders and organizations across sectors; and c) support leaders in becoming better equipped to sustain their energy over a lifetime of service. LAANE is a leading advocacy organization dedicated to building a diverse movement to work for a new economy that ensures we all have good jobs, thriving communities and a healthy environment. They strive for a society where people have power over their own lives and a voice in civic life, good career path jobs with family supporting wages and health benefits, and where they live in environmentally healthy communities with safe and decent housing, good schools, clean air and clean water, and other basic necessities. LAANE organizes broad alliances and they use community organizing, research and communications to build the power to pass innovative public policies. Their work is based on the conviction that jobs in growing industries which cannot be exported—particularly those in the service sector and the new green economy—are the foundation for rebuilding broadly shared community prosperity. They have programs that aim for creation of good jobs and environmental improvements in major areas of economic activity including port trucking, construction, energy efficiency, waste and recycling, grocery stores, and the tourism industry. This grant supports LAANE in enhancing their transformational organizing work with staff through retreats and transformational coaching. Management Assistance Group (MAG) strengthens visionary organizations to create a more just world. Since 1980, it has provided consulting and coaching services to thousands of organizations, leaders, networks, movements, and funders throughout the US and developed thought leadership on critical topics of concern for social justice actors. MAG has strived to meet its mission by evolving and utilizing innovative approaches to strengthening organizations, leaders, and networks; conducting research on critical organizational issues faced by its clients; and sharing its insights and experiences with the social justice sector and the nonprofit organizational development field. Movement Generation’s mission is to help build a vibrant and proactive movement for ecological justice and climate justice in the United States. Movement Generation works with emerging and young leaders from grassroots organizations in communities of color to forge long-term collaborations that help build a mass social movement for social and economic transformation grounded in an understanding of ecology. Specifically, they host retreat intensives focusing on strategy development, provides technical support and campaign integration to organizations working for ecological justice, and delivers community Earth Skills workshops. They promote a holistic approach to solving the “eco-crisis” (the crisis of home), as it has economic, ecological, interpersonal and intrapersonal manifestations. They seek to support creativity, collaboration and innovation towards a transformation in our movements. Movement Strategy Center (MSC) builds the progressive social justice movement by increasing the capacity of individuals, organizations, alliances, and sectors to be more strategic, collaborative, and sustainable. A national leader in the areas of political strategy and methodology, MSC supports organizations to develop the skills, culture, analysis, and vision to work together in broad alliances. MSC supports movement building by helping to build critical consensus and alignment around shared strategies through the development of local, regional and national networks of progressive groups across issues and constituencies. In promoting transformational movement building, MSC has developed new approaches and frameworks that place transformative practice at the core of progressive movement building. Mujeres Unidas y Activas (MUA) is a grassroots organization of Latina immigrant women with a double mission of promoting personal transformation and building community power for social and economic justice. MUA achieves its mission by creating an environment of understanding and confidentiality, empowering and educating its members to provide mutual support, offering trainings to build economic security and leadership, working in diverse alliances on the local, regional, national, and international levels, and organizing campaigns to win immigrant, workers’ and women’s rights. This grant supports MUA’s efforts to build the personal leadership and transformative organizing skills of their staff and constituents. The National Labor Leadership Initiative’s mission is to create a community of labor movement leaders dedicated to individual and mutual learning and development, strengthening and transforming the organizations they lead, and building a broad progressive movement that empowers working people in a rapidly changing world. Each year NLLI offers a national program which serves national elected union leaders and staff as well as leaders from national community organizing and worker center networks. The curriculum uses mindfulness as a key tool for developing self-awareness, emphasizing transformative personal leadership skills; tools for organizational leadership to make progressive labor institutions more powerful and effective; and building movement across labor unions, allied community organizing networks, and alternative forms of worker organizing. The Ohio Organizing Collaborative (OOC) is an innovative and experimental statewide organization that unites community organizing groups, labor unions, faith organizations, and policy institutes across Ohio. OOC’s vision is to organize everyday Ohioans to build a transformative base of power for the purpose of achieving social, racial and economic justice in Ohio. The OOC carries out this mission through investing in a diverse portfolio of organizing methods, experimental strategies, non-partisan 501c3 electoral programs, leadership training, and integration with policy organizations. This grant gives OOC the opportunity to strengthen its statewide infrastructure, build the leadership capacity of its staff and membership, equip OOC for even more effective organizing success and generate important lessons on best practices for state-based transformative organizing. Partnership for Working Families (PWF) is dedicated to building power and reshaping the economy and urban environment for workers and communities. They work to ensure that low- and middle-income workers and communities participate in the process and share in the benefits of economic growth and development, emphasizing the creation of high quality jobs, affordable housing, environmental health, and career pipelines for shared prosperity. Their current base of 17 established partners—augmented by more than a dozen emerging organizations and coalitions—is redesigning the way communities engage in decision-making, development, and the U.S political-economy. PWF has a core belief in participatory democracy, supported by deep, permanent relationships between union, community, environmental, and faith leaders and constituencies. They are cultivating a new generation of leaders that connects strategic worker and community organizing and cutting edge public policy to the building of an energized power base in key metropolitan areas nationwide. This grant supports PWF’s Leadership Development program, including the practice of transformational coaching. People’s Action Institute is a network of grassroots organizations that work to advance a national economic and racial justice agenda. PAI has over 200 organizers working in 29 organizations to unite everyday people in cities, towns, and rural communities throughout the United States. In an effort to build a deeper consciousness for social change, PAI engages their base through practices such as direct-action, house meetings and community organizing. The campaigns they support strive for tangible concrete changes for communities through policy and consciousness of social injustices and the empowerment to fight them. Core to PAI’s work is the belief that “personal transformation is the foundation of social transformation.” This grant specifically supports the transformative elements woven into their organizing model: attention to deeply personal relationship building, collaboration, compassion, and storytelling. Power California (formerly Mobilize the Immigrant Vote) was founded in 2004 as the first-ever statewide multiracial immigrant civic engagement coalition in California. Power California’s mission is to lift up the progressive voice and power of low-income immigrant communities of color in California through year-round and strategic communications, voter engagement, capacity building, and alliance building. They work to advance a new model of civic engagement and alliance building led by grassroots immigrant leaders themselves, rooted in a deep commitment to humanity and transformation, drawing on the most sophisticated thinking in the field, and highly agile to the changing landscape and needs. This grant supports PC’s transformative organizing practices and their work to incorporate culture shift and transformation at every level of their organization, including the Board of Directors, statewide staff, and community partners. Rainforest Action Network (RAN) campaigns for the forests, their inhabitants and the natural systems that sustain life by transforming the global marketplace through grassroots organizing, education, and non-violent direct action. RAN’s longstanding history of protecting rainforests remains at the heart of their work to confront the climate crisis, just as their ongoing solidarity with frontline and Indigenous communities remains a cornerstone of all their work. They assert that we cannot solve the climate crisis without protecting the world’s remaining forests, just as we cannot protect forests without curbing the causes of global warming elsewhere. This inescapable truth guides and informs RAN’s work and is the reason that they are dedicated to protecting the world’s remaining old-growth forests, while fighting climate change and accelerating a clean energy transition by ending our addiction to oil and coal. This grant supports RAN’s continued leadership trainings, staff retreats, and work with outside facilitators to promote transformational practice integration, personal ecology, and contemplative practices supported by natural spaces. Rockwood Leadership promotes social change by providing individuals, nonprofit organizations and issue sectors with powerful and effective training in self-reflective leadership and collaboration. Every year Rockwood serves more than 250 leaders working on key issues of our day. By the end of 2009, Rockwood had nearly 3000 alumnae/i, making it the nation’s largest provider of multi-day, transformational leadership trainings for the nonprofit social change sector. The Rockwood model of change begins with the premise that leadership can be taught and learned—it is not limited to an elite few. Equally important in Rockwood’s theory of change is that “personal mastery” is a primary component of creating leadership excellence. Set in a nurturing retreat environment, Rockwood’s unique curriculum employs exercises and perspectives that teach personal mastery and core leadership and collaboration skills, combining corporate leadership training techniques, personal growth methodologies, conflict resolution exercises, contemplative and reflective disciplines and emotional intelligence practices. The Ruckus Society is a multi-racial network dedicated to providing the necessary tools, preparation, and support to build direct action capacity for social change movements. They work with Indigenous communities, communities of color, and communities on the front lines, prioritizing the support of mass-movement and “people power” organizing for equity, justice, and ecological resiliency. Ruckus equips grassroots organizations with a toolbox of direct action skills through curriculum, intensive training camps, and a sophisticated network of action practitioners and trainers. Ruckus believes that vision-based, confrontational, and inclusive direct action is absolutely necessary for deep social transformation and that bottom-up organizing and movement-building are central strategies to social change. SCOPE (Strategic Concepts in Organizing and Policy Education) seeks to address the severe conditions of poverty and unemployment facing Los Angeles’ inner-city communities. SCOPE was established in 1993 in response to the civil unrest that took place the previous year in LA to develop proactive solutions that address the social and economic disparities faced by low-income communities of color that fueled the unrest. SCOPE fills a critical niche in the movement for social change—organizing communities of color in poor and working-class communities to ensure that they are active participants in the democratic process. Developed at the local level, SCOPE’s programs advance the interests of low-income families and create models that are replicable at the state and national levels. Hidden Leaf’s 2018 grant supports a new series of workshops and trainings for staff focusing on inner awareness, including a series of Healthy Lifestyle workshops for staff. The Social Transformation Project (STP) exists to catalyze networks of social change agents and practitioners committed to transformational change. They are developing resources to address the critical next-stage needs of leaders who require expertise and support to integrate transformational ideology, systems and practices into their organizations and movements. Their strategies are to: train and mentor significantly greater numbers of intermediaries to meet the growing demand for consultants and coaches trained in the transformational arts; support field-building by convening and facilitating the emergence of networks of transformational intermediaries and front-line leaders; support frontline leaders to bring transformational practices into their organizations, coalitions and movements; and develop and proliferate tools, practices, methodologies and ideology that empower the work of practitioners of social transformation. Stand (formerly ForestEthics) exists to protect Endangered Forests, wild places, wildlife, and human wellbeing. Their innovative, inspiring and effective campaigns challenge corporations and catalyze environmental leadership in industry, governments and communities. Their work has played a leading role in the protection of over 65 million acres of forests in the last several years. All of their achievements have involved turning corporate adversaries into allies. They approach each company with a nonjudgmental willingness to listen, and then vigilantly embody that spirit of openness throughout a long and often contentious process. They promote consciousness for social change through an extensive process of staff development that focuses on cultivating sustainable working methods, inner alignment and tools for personal mastery. Hidden Leaf’s 2018 grant supports Stand to expand and improve their usage of the concepts of personal mastery, at both the individual and organizational level. “Transformation: A Learning Community” is a section of the website Open Democracy, an independent and non-partisan website that brings together high-quality writing on politics, economics, social activism, and international relations. The overall site generates close to six million page views per year from 200 countries, with approximately one-third of readers living in the US. All content is freely available and republication is encouraged at no cost. The goal of Open Democracy is to raise awareness of the challenges facing humanity and how best to meet them using innovative solutions. The Transformation section (launched in 2013) specifically showcases cutting-edge examples of social transformation in practice, building links between activists and thinkers in the US and the rest of the world, fostering constructive debates and self-criticism about these approaches and their assumptions, and so helping shift the consciousness of those who are working for fundamental change in their societies in the direction of compassion and social justice. This project grant supports the production of the website. The Windcall Institute is dedicated to nurturing and developing resilient leadership among community and labor organizers engaged in the work of social justice in low-income communities and communities of color. Windcall fosters transformative leadership through its Residency and Staying Power programs aimed at improving the quality, effectiveness, and vitality of social movements and the organizers who devote their lives to them. They are addressing the need for organizers to be grounded, connected, and visionary in order to both imagine and implement life-affirming and creative ways to make fundamental social change, grounded in organizing.